Members of the Afghan Border Police prepare to roll through Afghanistan’s Khanashin district in a Humvee on Friday. KHANASHIN, Afghanistan – The Marines pushed out here early this morning, making their way to two Afghan Border Police outposts at the edge of a desolate wasteland desert. The convoys from Combat Outpost Payne have become routine, said Capt. Alexis Miguel, assistant team leader for Border Adviser Team 2, 3rd Battalion, 8th Marines. The advisers are primarily from Camp Pendleton, Calif., and attached to 3/8 in the field this summer. The shift to having Afghan National Security Forces in the lead providing their nation’s security has changed the way the advisers do business. They used to live alongside the border police on a nearby base known as South Station, but were pulled back to the larger COP Payne in June. “At this point, they’re used to working with U.S. forces, but now that we’re pulling away, it’s forced them to step up again,” Miguel said. For all the concern about Afghan troops turning on their American counterparts, the morale appears to be good between BAT-2 and the ABP. The Marine unit, led by Capt. Thomas Morse, was greeted warmly Friday, and sat with ABP personnel to talk shop over hot chai tea. For the record, they drink it with a lot of sugar. It isn’t half bad if you can get past the random twig or two floating in it. Marines here say the ABP unit they’re advising is solid, but it still faces challenges. One example: two ABP officers were recently taken prisoner in Sangin district by the Taliban while visiting family, the Marines learned Friday. The insurgents said they’ll release the ABP only if two Taliban fighters are also freed. By some measures, the ABP appear to run a loose ship. 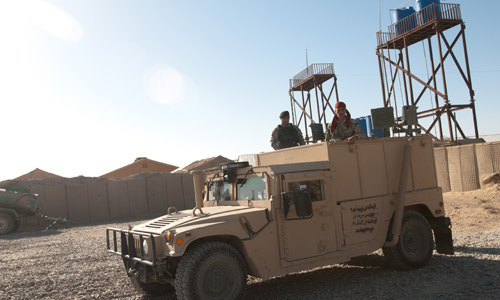 They patrol the region wearing brightly colored scarves on their head rather than helmets, and travel in Humvees with personnel sitting on the roof of the vehicle. The Marines are encouraged by some of the ABP’s recent actions, however. In one case, they caught an insurgent in Khanashin’s “Fish Hook” area digging a hole for an improvised explosive device after getting a tip from a villager. The staked out the area, which gets its name because it’s at a curve in the Helmand River resembling a fish hook. When the insurgent arrived, they rolled him up. The biggest adventure of the day: While returning to base, one of the Mine Resistant Ambush Protected All-Terrain Vehicles in the convoy began overheating. The Marines gave it time to cool and tinkered with it, eventually easing the vehicle back to Payne.